It is time for the average wine consumers, as opposed to tasters, to speak up. The current fad of higher and higher alcohol wines should stop. Most wine drinkers do not really appreciate wines that are 15 -16. +% alcohol. They are, in fact, hot and very difficult to enjoy with a meal. About the only dish that seems to put them in their place is a good hot, spicy dish. I don’t believe the average person is so insensitive to flavors and aromas that they must have a 15% Cabernet, Chardonnay, or Pinot Noir to get the aromas and flavors. Influential members of the wine press have lead the score chasing winemakers/owners up the alcohol curve and now I hope that it soon will lead them down. Winemaking is not really much different than cooking. The end product should be enjoyable to consume - not just to taste. Hopefully most who read this don’t think it’s a novel concept that we should be making wines to consume. Would you want to sample a soup, meat dish or other course that is so overpowering that you cannot enjoyably finish what is in front of you? These new wines are made to taste and spit – not to drink. This is all linked to my views on the ever evasive and vanishing terroir; the subtleties of terroir in wines have been melted together in a huge pot called “overripe” or the vogue “physiologically mature” grape. Gone are the individualities of specific regions, replaced by sameness – high alcohol, raisiny, pruney, flabby wines. Likewise, the descriptor “herbaceous” was often used in a positive sense when describing Cabernets. Now it is the kiss of death. Voluptuous – I do remember seeing that only occasionally, but not on the aroma/flavor wheel. So I would like the consumers to take the lead for a change, rather than being led. Ask for wines that are below 14% when you are out to dinner. The reactions are fun, but the results are not good for United States wines. The sommelier usually comes back with a French or New Zealand wine. On the restaurant level, high alcohol wines have reduced the number of bottles sold. It is very simple arithmetic; % alcohol times volume equals satisfaction. If % alcohol goes up, volume must go down for satisfaction to stay the same – or else we all get plastered. Consumers – wake up and get active. Reviewers -please at least include the labeled alcohol percentage in all your reviews, and try to remember that not everyone is spitting. At the second day of the National Beer Wholesalers Association meeting, the recurring theme was the preservation of the coveted three-tier system. In his address during the general session, Phillip Short, the 2006 chairman of the NBWA, issued a battle cry to rally the troops to action. “The middle tier is the window that allows the alcohol distribution system in this country to be transparent,” he evoked. In its infinite wisdom, Congress amended the Constitution in the early 20th century in an attempt to rid its citizens of the so-called scourge of alcohol consumption. Prohibition, as it was dubbed, stopped the sale of all alcoholic beverages within the United States. Guess what? It didn’t work. After a 15 year experiment, Congress passed the 18th Amendment in 1933 to rectify its previous mistake. Contained within this legislature were key elements designed to monitor alcohol distribution. One was to give each state the power to regulate alcohol within its borders; another created the three-tier system which placed distributors firmly between the supplier and retailer as an insulator. This seemed to work. For the past 73 years the three factions marched along blissfully and the government was satisfied. On the whole, the three-tier system was considered a good solution to total chaos. NBWA members, as well as its industry partners, maintain that distributors play an important role. State regulators know where the alcohol is coming from; they know where it is sold, and to whom; and probably most important in their eyes, appropriate taxes are being collected. Over the years, a few retailers challanged the system. They wanted direct access to the supplier. With the appearance of “big box” retailers (you know who you are) on the scene, their efforts were increased as they tend to purchase products in massive quantities. In January, 2006, the heat was turned up a notch when they involved their respective state, and federal judicial systems. Judgments were declared that potentially pre-empted the provisions of the 18th Amendment and jeopardized the three-tier system. Now you know why distributors are hopping mad. A panel moderated by Mark Brown of Buffalo Trace Distillery and comprised of Pat Gagliardi, Michigan Liquor Control Commission, Tom Haynes of the Coca Cola Bottlers Association, and Harry Schuhmacher, editor of Beer Business Daily, discussed the competition and regulation of the industry. Haynes of Coca Cola Bottlers stepped out on a limb and declared publicly that U.S. District Judge Marsha Pechman (who ruled in the Costco v. Washington State case last April against the state’s three-tier system rules) not only didn’t understand the 18th Amendment, but probably didn’t have a good grasp on the Constitution as a whole. NBWA’s political activist committee entered the battle in full force by lobbying legislators to protect their interests. In 2006, this powerful group raised $1.4 million toward its efforts, according to Steve Lytle NBWA PAC chair. Craig Purser, NBWA president. challenged the membership to switch their attitude of complacency to one of action. “We must be willing to stand up for this system of distribution and advocate an agenda that demonstrates the value that we have for our suppliers, licensed retail customers, and the millions of beer consumers,” he said. Understanding the stakes involved and how it would affect their bottom line, the suppliers were aligning with the distributors in the cause. Other issues were discussed during the session. Purser talked about the association’s efforts to educate the public on recent findings that moderate alcohol consumption can produce health benefits. Also, he explained the industry’s commitment to curb underage drinking, and stop the importation of products by start-up European companies that are not regulated and ship potentially harmful products to the United States. Mention was made of the revised dues system that will increases the maximum dues to $50,000 per year – a change from the current $25,000 cap – more about that tomorrow. All in all, the beer industry has enjoyed a good sales record in the past year. Some headlines proclaim: Beer is Back. But the leaders of the NBWA and its general membership contend it never left. When the call came from Jack Robertiello asking if I wanted to cover the National Beer Wholesalers Association Convention held in Orlando, I was intrigued. In addition to covering the event, which would bring a multitude of beer distributors from across the nation to sunny Florida, he said I could “quaff” as much beer as I wanted. Without hesitation, I accepted the gig – You had me at quaffing, I exclaimed. With that, the deal was sealed and I embarked upon a journey that would take me to the world of hops, barley and all of the other magical ingredients that combine to produce one of my favorite beverages. Marking its 69th year, the NBWA annual convention is taking place at the Orlando World Center Marriott Resort through Wednesday, Sept. 20. The first day was filled with board meetings and other association business, and understandably light on seminars as the more than 1,420 participants were still trickling in. However, a panel representing the import industry, retailers, and beverage analysts shared interesting insight into the growing presence of imported beers in the U.S. marketplace. Sponsored by the National Association of Brewers and Importers, the panel discussion was moderated by recognized beer guru Benj Steinman. Fellow panelist Don Blaustein of Heineken USA quickly agreed and went a step further to say that based upon the meteoric success of Heineken Premium Light, the imported light beers are here to stay. Admittedly, all panelists, including Greg Olson, a business manager of Circle K who represented the convenience store outlets, agree that it remains a challenge to introduce new beers, especially imports, to consumers. Domestic beers still dominate the market, and many times retail space dictates what is stocked and available to customers. The growing and changing demographic populations in the United States will continue to drive the beer industry – and imports are definitely finding a niche. Increased competition between the domestic and imported factions can only mean better beer. “Competition forces everyone to step it up and produce better-tasting beer,” said Figueroa. Speaking of better-tasting beer, I realized that I was yet to have my first brew of the day. I followed the crowd to the NBWA’s Welcome Reception and was immediately engulfed by the crowd. The poolside reception was elbow-to-elbow with beverage-industry executives, prominent distributors, retailers, and a smattering of reporters. It was evident by the way the participants interacted with each other that, though the association boasts a massive membership, those involved in the industry are a close-knit group. My quest for the evening was to find and taste the new darling of imported light beers – Heineken Premium Light. Unfortunately, there was none to be found among the plethora of beers iced in tubs throughout the premises. Heineken USA director of corporate communications Tamara Moore assured me that a shipment would arrive before the convention ends. Consumers today are responding positively to innovative packaging for wines, as a national survey’s latest results show screwcaps and wines in boxes/casks are gaining ground on traditional 750 ml. bottles. The results of an ACNielsen survey show that sales in U.S. liquor stores and other consumer outlets of premium wines with screwcap closures surged by more than 51 percent during the 52 weeks ending on April 11, compared with the prior year-long period. The findings were unveiled at the Alliance for Innovative Wine Packaging’s New Innovators Conference held at the Stony Brook University Center for Wine, Food, & Culture in New York on April 24. The study also confirmed the 3-Liter premium wine in a box or cask as the fastest growing premium wine packaging category, with 70 percent growth. Danny Brager, vice president of client services, beverage alcohol team at ACNielsen, who presented the results, revealed that the 750 ml. bottle category clocked just 12.3 percent growth, while the 187-ml. single-serve category grew by 17.3 percent. “Packaging that is innovative today will be mainstream in less than a decade,” said Paige Poulos, president of Paige Poulos Communications and founder of the AIWP. “The wineries that are the leaders in innovation today are poised to reap tremendous rewards as the market shifts,” she said. Steve Morgan, vice president of marketing for Delicato Family Vineyards, said Delicato “is leading the way by becoming the largest U.S. winery to completely eliminate cork closures on its wine products.” He also said that dollar-volume wise, three-liter boxed wines priced from $12 to $15.99 have increased by 105.3 percent and those over $16 showed gains by 75.8 percent. Varietals in both red and white categories showed growth during the ACNielsen survey period, although pinot noir stood out -- with 68 percent growth. Other gaining varietals included pinot grigio (up 22.1%), and cabernet sauvignon (up almost 10%). Losing ground were merlot (-1.5%) and white zinfandel (-1.6%). It took a few moments for this to sink in. We were ten hours away from the door opening for the dinner and we needed product. For some reason, the thought came to me that I could find quail eggs if I went to one of the numerous Asian markets in Chinatown. I grabbed a quick shower and headed to Canal Street. It was raining, the streets were teeming and in the markets along Canal, Mott and Mulberry Streets the vegetables, fish, meat and birds looked great, but no quail eggs. And guess what? Nobody in these markets speaks English. When I would ask for quail eggs, it was as if I had said, “Doorknob milktoast hobnail earlobe.” This was getting me nowhere. It was nearly noon. Whole Foods came to my partial rescue. I took the subway up to Union Square and searched out the produce manager. “Yeah, we can give you a case of 48 avocados and throw in a restaurant discount.” Good start. Banana leaves? Quail eggs? No shot, but I found some tamarind paste, scooped up the last five jars and headed back to base-camp. At the Beard House, Andina’s GM was calling me to say he had found the quail eggs and banana leaves (just in case you ever need them, they were at Citarella on 9th St. and 6th Avenue). The chefs were rocking in unison now, and the small kitchen in the old house was humming with an energy that is only found in fine restaurants. It was a familiar and comforting feeling. At this point, I knew we were going to be fine. The service staff at the Beard House appeared relaxed, and went about their setup as if on automatic pilot. They had seen it all before, and had probably answered the exact same questions we posed numerous times. Their aloofness actually inspired confidence. Something really interesting happened at lineup (a short conference between managers and staff outlining strategy just before service). Mama Doris, Andina’s owner from Peru, was giving the mostly Latino staff an overview of what the restaurant was about, and how the country’s culture and local products are portrayed in each dish. I saw an attentiveness and respect in their eyes. Her passion and sincerity was indicating that this dinner was destined to be a bit different. We opened the evening with fresh Pisco Sours, a traditional Peruvian cocktail. We were serving 85 people, including a mix of invited press, board members and Beard House Foundation members, and the public at large. After the crowd was seated, Mama Doris spoke about the food and I had a few moments to talk about the wine pairings. The stage was set. I honestly believe the people were taken aback by what came to the tables. This sophisticate crowd didn’t really know what to expect from Peruvian food, and its flavorful finesse, matched with the appropriate wines, had caught them off-guard. As I circled among the diners explaining the tastes of each of the wines, one comment after the next confirmed this sort of happy surprise. At evening’s end, after the chefs had taken their well-deserved curtain calls, I was told something by one of the servers that provided a synopsis of the very reasons we were in the building that night. She said, “We normally have three garbage bags of food left over at the end of most meals here. Tonight we have less than one. All the plates were coming back empty.” Pure music. We had hit a home run. In the fall of 2005, Andina Restaurant in Portland, Oregon, was invited to present a dinner at the James Beard House on Monday, January 23rd, 2006. Andina is owned by a Peruvian/American family. It’s a two-an-a-half-year-old stand-alone restaurant, and is the culmination of a dream that many folks who open ethnic restaurants have: to bring the tradition and culture of their country to America’s diners through their cuisine. early years, he wanted to be in the theater, but failing in that endeavor, he turned to a passion he had gained from his family: food and cooking. It became apparent that he had a distinct ability to write and teach about this subject, and was a prolific author, penning over 30 books in his lifetime. He was America’s first cooking celebrity. In 1955, he established the James Beard Cooking School, and continued to teach aspiring chefs until his death in 1985. The James Beard Foundation reprises his inspiration today by inviting restaurants to cook at the James Beard House (where he actually lived) on West 12th Street in New York City’s Greenwich Village. Being invited to showcase your cuisine at the Beard House is perceived as an honor among restaurateurs. After accepting the invitation, the owners began to realize the enormity of moving an entire restaurant’s concept 3,000 miles across the country, then condensing this concept into a service lasting three hours. To address the task, a team was formed to go to New York consisting of: the general manager; the chefs (present, consulting, and former chefs asked to join in); the wine director (that’s me); a valuable kitchen employee that knows the food inside-out; and one of the owners, Mama Doris Platt de Rodriguez, who represents the soul of the restaurant. A representative six-course menu was formulated, highlighting all the unique and diverse flavors that make up Peruvian cuisine. I would call it a combination of indigenous ingredients, which then incorporates Asian (mainly Japanese and Chinese) and European (mainly Italian and French) influences. I got together with wine distributors and two local wineries in Oregon to put together pairings that best matched the food, using wines strictly from Oregon and South America. In the weeks prior to the dinner, speakerphone calls were exchanged with the event coordinator at the Beard House, the invaluable Sal Rizzo. We learned about what shapes and types of china, flatware and stemware were available to us (which would prove moot when the Beard House changed their flatware purveyor the week before our event); when we could have possession of the kitchen in order to prep (it turned out there was no event on Sunday, which afforded us a full day and a half of prep time); which equipment was onsite, and how much space there was to store our perishables, non-perishables and wine. We watched a virtual tour of the house’s kitchen that is provided on the website, and got the lowdown on how we’d be able to serve up to 100 guests in the tight quarters this old brownstone allots. Forearmed with the above information, we departed on Saturday night on the midnight red-eye flight out of Portland, which would get into JFK at 8am. Here’s how we then went about putting the dinner together. After getting to our hotel adjacent to Washington Square Park in Greenwich Village at about 9:30 am, we found out that our rooms couldn’t be occupied until after 3 pm. The luggage dropped, we headed out to Chelsea Market on 9th Avenue and 15th Street. This market has it all; fish, meat, produce, wine, art and the offices of Major League Baseball. Orders had been made prior for the meat, fish and some of the produce we needed. A setback occurred when the chefs found the wrong kind of limes. We usually work with key limes, and they play an integral part a number of the restaurant’s dishes. Wine guys are window dressing on a food-buying expedition, so since I grew up in Greenwich Village and knew the area, I set off in search of key limes. It quickly became clear that key limes are tough to locate in January in Manhattan. I scoured the neighborhood, in all the elite shops, and completely struck out. The streetwise New Yorker had to return empty-handed to the group. Luckily, one of the chefs bailed me out, having worked out a deal for a Monday delivery to the Beard House (from the same guy who said he didn’t have any), albeit at a higher price. We got to the Beard House about 1 pm to set up and prep. Our six course menu called for aji amarillo, aji mirasol, aji panca and rocoto (Peruvian chiles); regular, sweet and purple potatoes, quinoa, corn and fava beans; smoked trout, sea urchin, salmon, scallops, sea bass, octopus, prawns, crab, lobster, halibut and tuna; plus chicken, lamb rack and pork belly. Throw in some lemongrass, coconut milk, tamarind, quail eggs, passionfruit mousse, chocolate sorbet and freshly made quinoa bread and you start to get the picture. This is complex food. Beside the bowl of Creole spice boiled shrimp and pickled fresh hearts of palm with the crawdaddy resting on top was something to wash it down with, and it wasn’t a glass of wine; It was a unique cocktail designed to compliment this first course of a cocktail dinner presented by master mixologist Dale DeGroff and chef Carlos Guia at Commander’s Palace, Las Vegas. This was the first of several special events being offered, where a little creative marketing on the part of general manager Michael Smith is bringing a new dimension and a lot of fun to their guests’ dining experience. But let’s start at the beginning; a little over a year ago the Museum of the American Cocktail opened in New Orleans and enjoyed a year long stint at the New Orleans Pharmacy Museum. Due to the hurricane, some real estate plans fell through and the Museum once more needed a new home. Enter Ti Adelaide Martin, one of the Brennan Family members who seem to have a soft spot in her heart for stray pups and cocktail museums. Martin invited the Museum founders to relocate their exhibit in Las Vegas. Now Commander’s Palace has a room at the front of their restaurant completely devoted to the world of the cocktail. The new exhibit, designed and curated by Ted (Dr. Cocktail) Haigh, is a playful mix that includes Trader Vics and Tiki barware, Hollywood memorablia, rare books on mixing, an amazing assortment of bottles and shakers, prohibition literature, toys and sheet music that leads you through several different eras and covers over two hundred years of wacky cocktail history. The festivities began Sunday night with a grand opening celebration in which classic cocktails from four different eras were shaken up by New Orleans barman Chris McMillian, served by waitresses in period dress; one dressed as a Roaring Twenties flapper serving the Monkey Gland, a 1920’s drink from Harry’s Bar in Paris that’s made with gin, orange Juice, Grenadine, and a splash of Pernod Anise. Another server dressed in a sixties Mod costume served the Vesper, the original James Bond Martini. There was also a lovely southern belle serving the Colony Cocktail, a blend of vodka, Southern Comfort and lime juice, and let’s not forget our nineties girl who served up Cosmopolitans. All of the drinks were made from fresh squeezed juices combined with exotic flavoring and spirits, and they were disappearing quickly. On Monday evening, two of the Museum co-founders, Jared Brown and Anistatia Miller hosted a vodka presentation at the MGM, unveiling a brand new product called Heavy Water Vodka. Spirits writers Miller and Brown (author of "Shaken not Stirred, A Celebration of the Martini") also publish the Museum’s annual journal Mixologist, Journal of the Museum of the American Cocktail which is available for sale at the exhibit, and free to anyone who becomes a member of the Museum. On Tuesday night, DeGroff, the founding president of the Museum and author of "The Craft of the Cocktail," hosted a cocktail dinner that was attended by 60 guests. The crowd included spirits writers, bartenders, and bar owners, local media and brand managers from around the country. The final event was given on Wednesday morning by Francesco LaFranconi: “The Anatomy of the Cocktail.” LaFranconi, director of Southern Wine and Spirits’ Academy of Spirits and Fine Service, shared his knowledge and talent with a group that consisted of industry people, the media, and some who were there to simply enjoy the show and learn how to make a good balanced drink. Francesco’s marvelous libations included the “Pan Pacific”, made with Barsol Pisco, passion fruit puree, lime juice, and a rock candy syrup, a Mon Ami Pasti, a mix of Pernod, fresh cream, and pistachio. 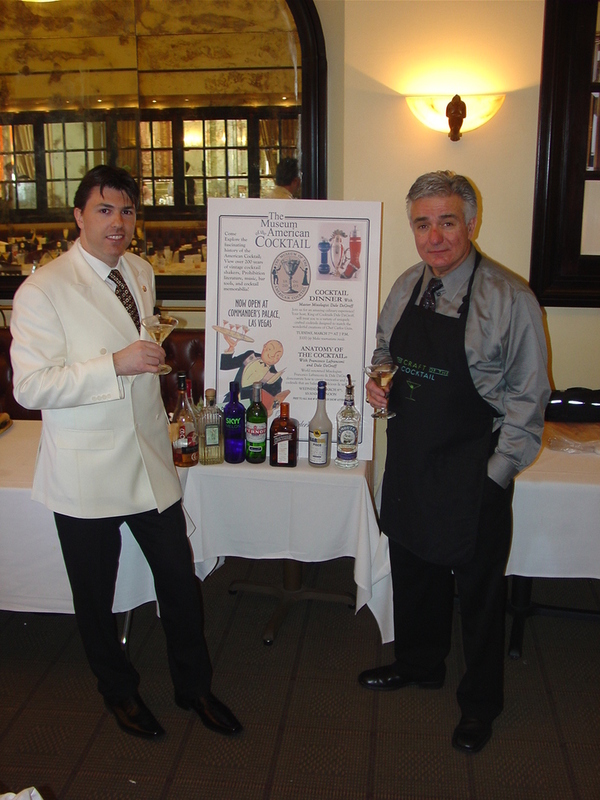 DeGroff also presented two dirnks at the seminar: the Angel’s Passion and the Ritz Cocktail. The Museum of the American Cocktail is the first of its kind to celebrate this unique aspect of American history and thanks to the Brennan Family, a sophisticated approach to mixology and genuine Americana is now being introduced in the city of glitz. It appears that not only will they attract workers in the hotels and restaurants, but also cocktail aficionados from everywhere who will welcome the chance to enjoy an extraordinary meal at Commander’s Palace while taking in a little history too. The Museum of the American Cocktail will be open each day during the restaurant’s regular hours and will reside there for a year. Visting mixologists, many of whom regularly appear on television will come to Commander’s Palace over the next few months to present cocktail dinners and drink seminars. On April 13th Tony Abou-Ganim will present a Bacardi Rum Cocktail Dinner and on the 14th he will present a seminar, “Great Classic Cocktails At Home,” and on May 12th, Francesco Lafranconi will present another special cocktail dinner. Register for cocktail seminars online (cost is $45) by visiting: www.museumoftheamericancocktail.org.